The River Thames burst its banks on Wednesday, forcing the evacuation of hundreds of homes in the university city of Oxford in Britain's worst floods for 60 years. About 350,000 people faced two weeks without running water and insurance companies said the bill could soar to 3 billion pounds ($6.2 billion). Farmers say harvests have been badly hit and that farm animals in flood-hit areas could die unless water supplies are restored soon. 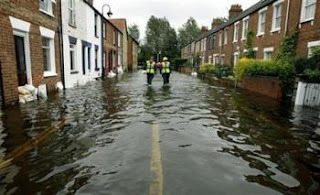 Visiting the worst-hit area in Gloucestershire, western England, Prime Minister Gordon Brown pledged more cash for stricken areas and more tankers and bottled water to ensure supplies. Oxford became the new frontline when rivers feeding into the Thames spilled over into its streets, forcing police to evacuate 250 homes. Aerial pictures showed flood waters not far from some of the city's historic college buildings. Heavy rain is expected overnight and Environment Agency officials warned that the river had not yet peaked. 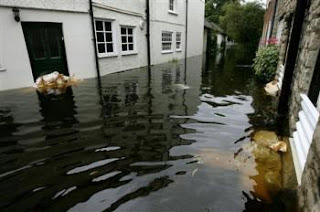 As the flooding spread along the river, officials said Queen Elizabeth's residence at Windsor Castle was not threatened and no property flooding was expected in London -- although heavy storms could always cause flash flooding. 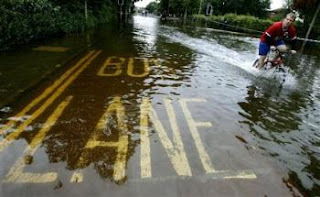 "There are six severe flood warnings in place. It looks as if we are going to get up to 20 millimeters (0.8 inch) of rain across the board tomorrow," an Environment Agency spokesman said. Milk shortages hit some areas with flooded roads making collections from dairy farms impossible. The rain brought harvesting of barley and rapeseed to a halt in many regions. One power substation in Oxford was closed as a precaution, after it was partially flooded at the weekend, but customers have not been cut off because supplies were re-routed. Sandbags were piled up to protect other substations in the area. Economists say the floods will trim back economic growth and are likely to trigger a short-term spike in food prices, but the overall economy is likely to weather the storm in the long run. One beneficiary of the bad weather was the airline industry. British Airways said seat bookings for long flights were up as holidaymakers escaped the British summer. 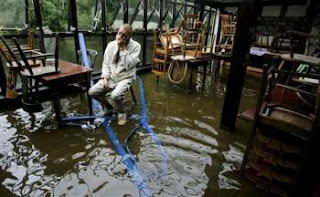 "We need to invest more in preventing floods," Brown told parliament. Less than a month into the job as Britain's new premier, he said everything had to be looked at from infrastructure and drainage to where utilities were located. In a stark reference to how 21st century weather had changed, finance minister Alistair Darling said: "Climate change is not a passing trend. "It is a reality we must factor into everything we do. If we do not, threats to our everyday life -- like the floods this week -- risk becoming common." We have a friend in Oxford and I certainly hope he and his family and their neighbors are all right ... but I suspect they're not. 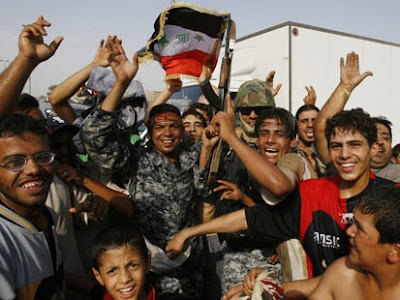 Earlier today the multi-ethnic Iraqi national soccer team beat South Korea in a dramatic shootout and qualified for the final of the Asia Cup -- after which suicide bombers attacked the dancing crowds in the streets of Baghdad, killing at least 50. But we didn't see the dead and wounded in the streets. We never do. All we see are the crazies, celebrating with their flags and their AK-47s. If photo essays on the devastation of Iraq covered the front pages of every major daily, every day, how much longer do you think the war would go on? 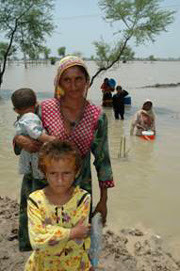 The flooding in Pakistan is far far worse, and as usual this has been ignored or at least under-reported in the West. KARACHI: Six more villages have submerged due to increase in water level in tehsil Juhi of district Dadu while the land communication of Jhal Magsi and Ganda Wah could not be restored even after one month. An engineer of the Irrigation Department, Habib Alal Kabro said that the 30-feet breach in tehsil Khairpur Nathan Shah has been repaired by the staff of the department within two days. However, five villages -- Goth Qanb, Goth Allan Laghari, Goth Haji Khan Babbar, Goth Gharo and Shahi Laghari -- are still underwater due to this breach. Relief operation continues in the flood-affected areas of Turbat and Kharan while according to the health department of Turbat, three of the gastro patients brought from the flood-affected areas to Civil Hospital Karachi have died. Sindh Relief Commissioner Anwar Ahmed said that the Sindh Relief Commission with the collaboration of the Pak Army distributed 60,000 bags of food and 30,000 tents in the flood-affected areas. Chief Minister Balochistan Jam Mohammad Yousuf has declared the province a calamity-hit area and announced to waive the provincial taxes due to heavy damages caused by rains and flood in Balochistan. Chief Minister Jam Mohammad Yousuf said that he demanded from President Pervez Musharraf to direct the federal government also to waive its taxes for all over Balochistan. The chief minister Balochistan appealed to all friend countries for providing aid to the flood-affected people of the province.